The price of RINs is once again making headlines. As Figure 1 shows, the attention is well-deserved. The price of D4 biodiesel, D5 advanced, and D6 ethanol RINs in the secondary market have once again spiked upwards in rather dramatic fashion. Just two weeks ago D6 RINs were trading at $1.02 per gallon and have since risen to $1.46 per gallon. That is over a 40 percent jump in value in two weeks! We explore in this post what is behind the spiking RINs prices and what this reveals about market expectations regarding the impending collision of the E10 blendwall and RFS biofuels mandates. We begin by reviewing the analysis found in our April 24, 2013 farmdoc daily post entitled “Is Speculation Driving Up the Price of RINs?” Figure 2 (Figure 5 in the earlier post) is the key. It shows a simple model of supply and demand for the U.S. ethanol market. The model has a vertical (perfectly inelastic) segment at 5 billion gallons in order to represent the demand for ethanol as an MTBE oxygenate replacement. It is vertical since non-ethanol alternatives are prohibitively expensive. The demand curve then becomes flat (perfectly elastic) for ethanol prices equal to 110 percent of CBOB prices between 5 and 13 billion gallons. The demand curve becomes vertical again to reflect the E10 blendwall, which is assumed here to be 13 billion gallons. The red vertical lines represent the renewable (ethanol) RFS mandate for 2011 (12.6 billion gallons) and 2013 (13.8 billion gallons). The 2011 RFS mandate does not cause any problems, even though the equilibrium quantity is stuck at the 10 percent blendwall, because the mandate is less than the blendwall. An entirely different situation is presented in 2013. Now the RFS mandate exceeds the 10 percent blendwall quantity of 13 billion gallons. If a stock of D6 or higher-nested RINs is not available to fill in the gap between 13 and 13.8 billion gallons there is no feasible market equilibrium since the RFS requires more gallons to be blended in the motor gasoline pool than is physically possible. The RFS does have some flexibility built into it, in that it is possible to accumulate RINs stocks and higher nested RINs can be used to meet lower-nested mandates if no stocks of RINs are available for the lower-nested category. If we assume that the stock of D6 ethanol RINs is zero, then compliance for the wedge between 13 and 13.8 billion gallons will simply be transferred to the next higher nested non-ethanol category of the RFS. At the present time biodiesel is the only higher nested non-ethanol type of biofuel that is potentially available in large quantities. So, in this framework the 800 million gallons of the renewable mandate above the E10 blendwall are effectively converted into an additional biodiesel mandate over and above the existing biofuel mandate. The EPA has proposed a 2013 biodiesel mandate of 1.28 billion gallons, which would rise to 1.81 billion gallons in this analysis due to the “extra” biodiesel needed to meet the renewable mandate (1.28 + 800/1.5). Of course, we know that in reality there is a large stock of D6 ethanol RINs that can be drawn upon to meet the renewable gap above the blendwall. The key is that our analysis shows the value of the D6 RINs in this stock should be basically equal to the price of D4 biodiesel RINs since in the absence of the stock of D6 RINs the renewable gap would have to be filled by producing and blending biodiesel. We can also show that as long as biodiesel is the marginally most expensive alternative for fulfilling the advanced RFS mandate that the price of a D5 advanced RIN should also equal the price of a D4 biodiesel RIN. We noted in in our April 24th post that the prediction of this model for the merging of D4, D5, and D6 RINs prices held up rather well. Figure 1 shows that as RINs prices have spiked in the last few weeks the price of the different RIN classes has essentially merged to the same value. The price of D4 and D5 RINs yesterday (July 18) were exactly the same, $1.465, and the price of D6 RINs was only one cent less at $1.455. What all this means is that if one wants to understand the reasons for the spiking RINs prices one has to dig into the factors that are driving the price of D4 biodiesel RINs. In our April 24th post we also showed how the price of ethanol RINs was determined under a binding mandate. 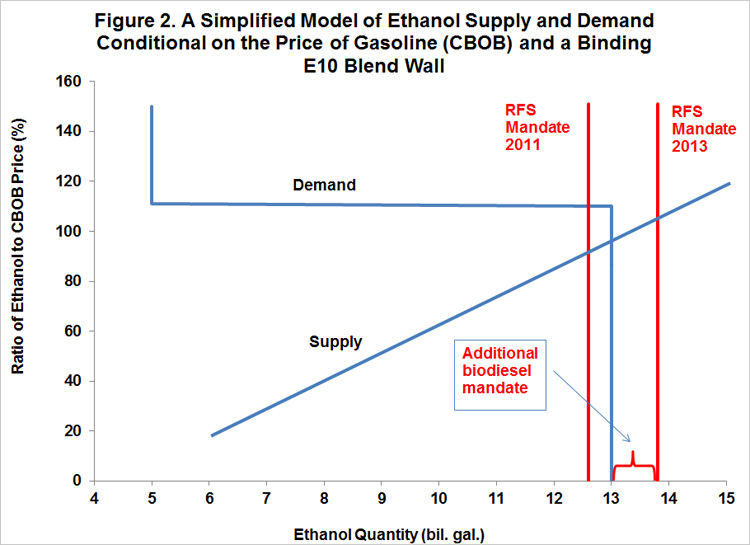 Figure 3 shows how this works for a binding biodiesel mandate where the mandated quantity is above the market equilibrium quantity. Note that the analysis assumes there is not a biodiesel blend wall analogous to the E10 ethanol blend wall. This is a reasonable assumption given the relatively low blends of biodiesel currently in use. So, in order to get this higher than equilibrium quantity produced, biodiesel producers must be paid a price that is higher (Ps) than the market equilibrium price (P). Likewise, diesel consumers will only consume this higher quantity at a price lower (Pd) than the market equilibrium price (P). From the perspective of a diesel blender, there is now a wedge between the price they pay biodiesel producers and the price they charge consumers for the biodiesel implicitly in diesel blends. This wedge, or loss, is exactly equal to the price of a D4 biodiesel RIN. In this framework, blenders are indifferent to physical blending of biodiesel with diesel at a loss of Ps minus Pd per gallon of biodiesel or paying the same value for a RIN in the secondary market. 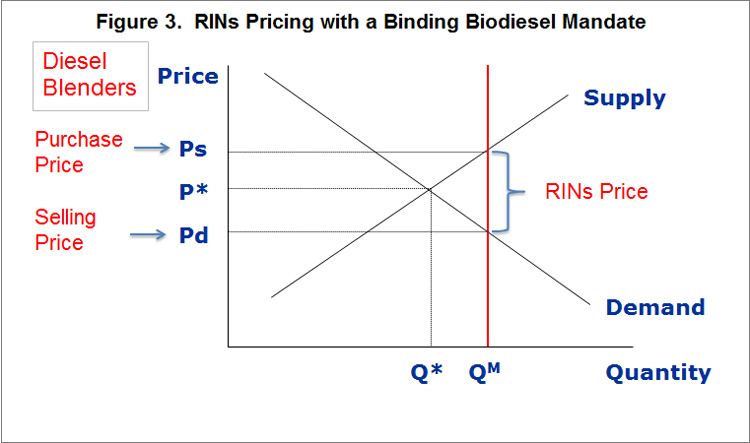 The model in Figure 3 indicates that D4 biodiesel RINs prices should correspond closely with blending margins for biodiesel. 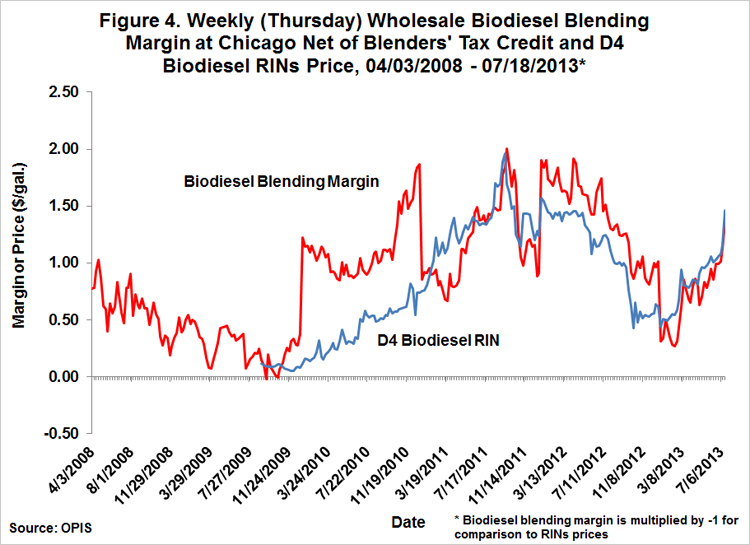 Figure 4 shows the biodiesel blending margin at the wholesale level in Chicago and D4 RINs price from April 3, 2008 through July 18, 2013. The D4 RINs prices available from OPIS begin on September 3, 2009. The biodiesel blending margin is normally computed as the price of ultra-low sulfur diesel minus the price of biodiesel plus the $1 biodiesel blenders’ tax credit when it is in effect. Here, we multiply the margin by -1 to facilitate comparison to the market price of D4 RINs. As expected there is a general correspondence between the movements of biodiesel blending margins and the D4 RINs prices. There are several reasons why the correspondence is not exact. First, the on and off nature of the blenders’ tax credit and expectations about the retroactive application of the credit complicates D4 RINs valuation. Second, the RINS market has to not only reflect current blending margins but also expectations for blending margins in the future. Third, there have been considerable problems with fraud in the D4 RINs market and this surely has affected prices at times. Despite these complications the overall message from Figure 4 is clear—biodiesel blending margins are the major determinant of D4 RINs prices. This is especially revealing as we consider the recent spike in D4 prices. 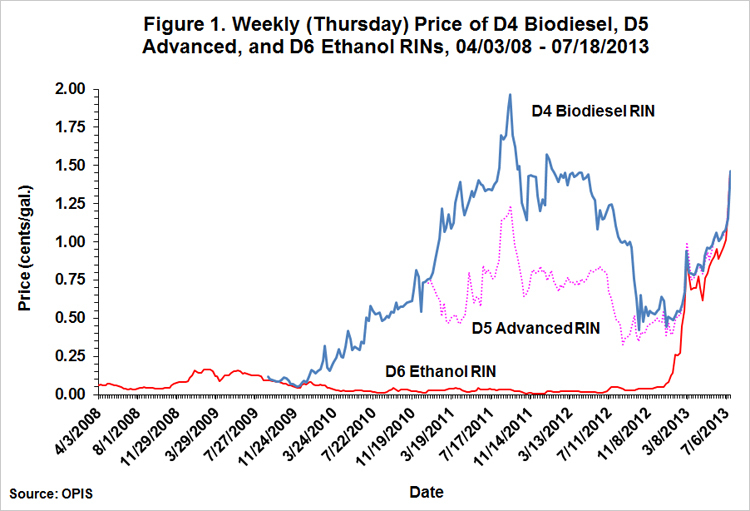 Basically, D4 prices have closely tracked the rise in biodiesel blending margins. For example, the blending margin for biodiesel was $1.35 per gallon (after multiplying by -1) on July 18th and, as we noted above, the D4 RINs price on the same date was $1.465. The next obvious question is what is behind the rapidly changing biodiesel blending margins in recent weeks? 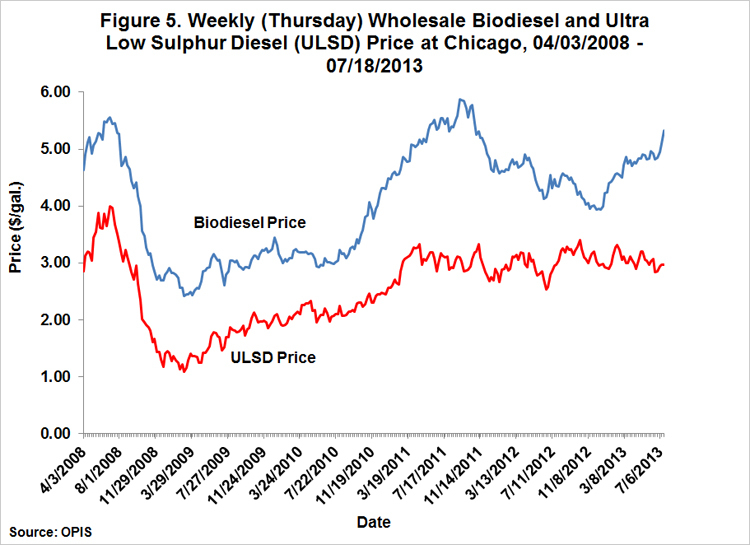 Figure 5 shows the wholesale price of biodiesel and ultra low sulphur diesel (ULSD) at Chicago from April 3, 2008 through July 18, 2013 and it reveals the answer to the question. Biodiesel prices have been on a tear since the beginning of the year, with prices increasing from about $4 per gallon to as high as $5.30 per gallon in recent days. This has occurred at the same time that diesel prices have essentially remained flat, which means that the wedge between biodiesel and diesel prices has increased sharply since the first of the year. This has in turn been the driving force behind the increase in D4 biodiesel RINs prices. The continued stratospheric rise in RINs prices has a number of important implications. First, it suggests that the E10 blendwall is or shortly will become tightly binding. Otherwise, D5 and D6 RINs would not be valued as D4 RINs. Second, the rise indicates that market participants do not expect this “steep” E10 blendwall to be breached in the near future through expanded consumption of higher ethanol blends such as E15 or E85. This is consistent with the arguments found in our recent farmdoc daily posts on the topic (see here, here, and here). Third, the rise suggests that market participants are not expecting a dramatic change in RFS rules for 2014 (such as our earlier “freeze it” proposal). Fourth, the rise shows that the pressure of meeting the RFS renewable (ethanol) mandate with a binding and steep E10 blendwall ultimately shows up in the price of biodiesel. The bottom line from our analysis is that if any market can be said to have “gone wild” it is the biodiesel market rather than the RINs market. This highlights the policy bind that the U.S. currently faces with regard to implementing the RFS mandates as well as the importance of monitoring developments in the biodiesel and related feedstock markets. We will explore both in future farmdoc daily posts.